Being passionate and loving the language you are learning is one of the surefire ways to guarantee success. In fact, you can succeed in virtually anything if you are passionate and determined enough. Now, you might say, “Okay, okay that all sounds good, but what if I’m not all that passionate about languages?” Well, I’m glad you’re asking! The thing is that passion is something you develop, and for a lot of people, the only experience they’ve had with language-learning was a few classes in grade school. How exciting! This only creates an association with homework, grades and deadlines. Now, if you are in school, it doesn’t mean you’re doomed! It’s possible to create passion for the language, you must simply make it part of your daily life in engaging ways. You know how sometimes we love a song so much because it reminds us of a cool road trip we had years ago? This works in a very similar way. Let’s say you travel to another country… you’ll be totally immersed in the foreign language and you’ll associate it with discovery, new experiences and great memories. That’ll get your spirits up! You’ll likely come back from that vacation wanting to learn the language because you found it beautiful and want to be able to communicate when you get back. As time goes by, if the language does not stay part of your life, this passion will fade and you’ll forget why you wanted to learn the language in the first place. Sounds familiar? But if you keep the language in many aspects of your life, you’ll keep the passion with you and build from it. While traveling certainly helps getting the passion machine going, it is not mandatory. First, you need to find a learning method you enjoy and stick to it. Ouino is an excellent choice! But you also need to make a few changes to your life to create an artificial immersion in your new language. Change the language of your Facebook, follow people who speak your language on Twitter, watch movies and TV shows in your new language, listen to music. Even if you don’t understand a thing at first! It will train your ear to the language, and at the very least increase and maintain an interest for the language. The exposure to different people, movies, books, music and the culture in general is one of the main reasons why people learn a language and it’s simply awesome! The beauty of language learning comes from all the associated benefits a new language can bring you. We live in a world where information and media are more accessible than ever, use that to your advantage! 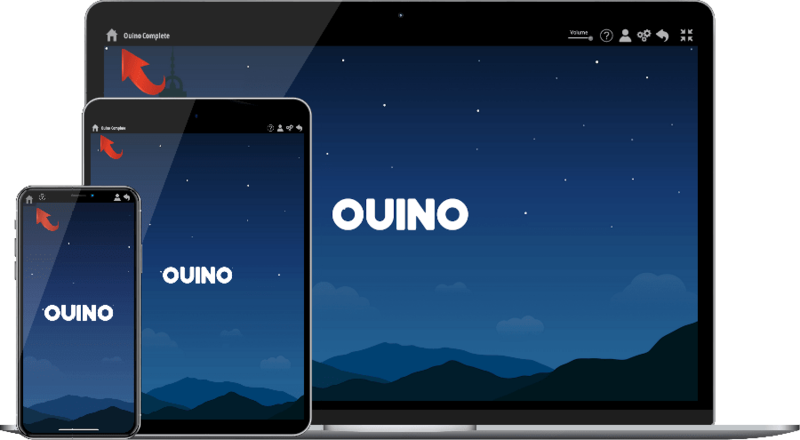 We strongly believe that a program like Ouino can truly turn your learning into overdrive, but that you must also make the language part of your life to keep that passion and momentum going. Plus, it will help you retain a lot more information. Memory has a way of fading if things are not reinforced. If in your daily life, you hear the words you just learned over and over again in dozens of different ways, those words will become fossilized in your brain. People often wonder why they are having trouble remembering the words they learned. There’s a very simple answer to that: They haven’t heard it enough! For example, how many times have you heard the English word “blue” in your lifetime? Thousands! That’s what makes you a true master in your native tongue. What did that moment mean to you? Not a whole lot I bet. You didn’t think very hard, you didn’t feel much emotion, you didn’t even actually see the color “blue” as an association with the word. You made a very simple connection with the word, but it wasn’t meaningful in any way. You’ll likely have to look it up a few more times before it really sticks. Have you ever looked at the time on your watch or phone and instantly forgotten it? This happens to people all the time. But why? Well, simply because it’s not really significant. But what if you look at the time and discover you’re late for your dream job interview, the time suddenly becomes very significant, right? I guarantee you’ll remember that one. But let’s say you’re having an engaged conversation and you stumble on a word you can’t remember… You are thinking really hard to find the word, your brain is committed. When you finally remember the right word, you have different emotions, often happiness and relief. Phewww! The conversation can continue! This kind of interaction creates a very strong bond in your memory and that word will likely be stuck in the abyss of your mind for eternity. A lot of people spend a lot of time looking for the miracle language-learning method. Sadly, there are no language-learning miracles. But if you find a learning method you enjoy, increase your passion for the language by making it part of as many aspects of your life as possible and if you create meaningful interactions, success is just around the corner. If you enjoyed this post, feel free to share it with your friends by using one the social links below. If you are looking for a language-learning method with a lot of interaction and activities that will keep you engaged, check out our website at Ouino.com. Thanks a lot! Until next time! I’m Italian and I’m 19. You article is extraordinary true. In Italy we have many difficulties by learning English because we study especially grammar at school. When I started to learn English alone for IELTS exam , everthing changed. Now I’m not so bad in English . In particular I’m very good in reading, but I want to know English like a second language. I’m searching a method that make me able to memorize as many words as possible. Have you some concrete suggestions for me , for learning more about your language? Notwithstanding , I will use your website for learning French. More languages , more point of view , better life.